Download "CODE OF GEORGIA TITLE 19. DOMESTIC RELATIONS CHAPTER 7. PARENT AND CHILD RELATIONSHIP GENERALLY ARTICLE 1. GENERAL PROVISIONS"
3 (G) Professional counselors, social workers, or marriage and family therapists licensed pursuant to Chapter 10A of Title 43; (H) School teachers; (I) School administrators; (J) School guidance counselors, visiting teachers, school social workers, or school psychologists certified pursuant to Chapter 2 of Title 20; (K) Child welfare agency personnel, as that agency is defined pursuant to Code Section ; (L) Child-counseling personnel; (M) Child service organization personnel; or (N) Law enforcement personnel. 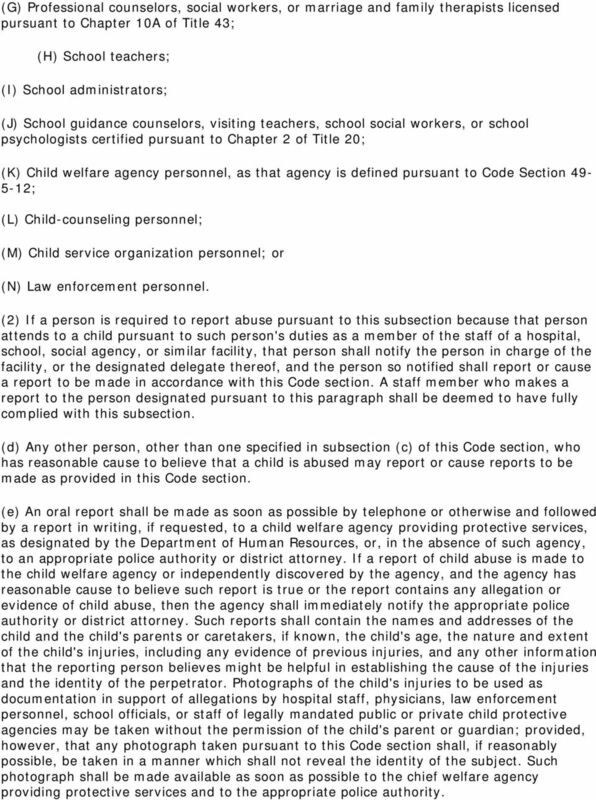 (2) If a person is required to report abuse pursuant to this subsection because that person attends to a child pursuant to such person's duties as a member of the staff of a hospital, school, social agency, or similar facility, that person shall notify the person in charge of the facility, or the designated delegate thereof, and the person so notified shall report or cause a report to be made in accordance with this Code section. A staff member who makes a report to the person designated pursuant to this paragraph shall be deemed to have fully complied with this subsection. 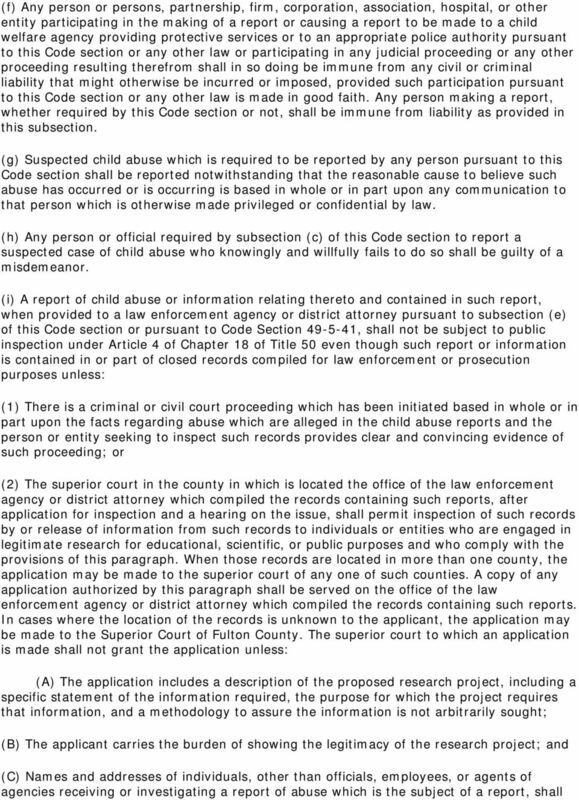 (d) Any other person, other than one specified in subsection (c) of this Code section, who has reasonable cause to believe that a child is abused may report or cause reports to be made as provided in this Code section. (e) An oral report shall be made as soon as possible by telephone or otherwise and followed by a report in writing, if requested, to a child welfare agency providing protective services, as designated by the Department of Human Resources, or, in the absence of such agency, to an appropriate police authority or district attorney. If a report of child abuse is made to the child welfare agency or independently discovered by the agency, and the agency has reasonable cause to believe such report is true or the report contains any allegation or evidence of child abuse, then the agency shall immediately notify the appropriate police authority or district attorney. Such reports shall contain the names and addresses of the child and the child's parents or caretakers, if known, the child's age, the nature and extent of the child's injuries, including any evidence of previous injuries, and any other information that the reporting person believes might be helpful in establishing the cause of the injuries and the identity of the perpetrator. Photographs of the child's injuries to be used as documentation in support of allegations by hospital staff, physicians, law enforcement personnel, school officials, or staff of legally mandated public or private child protective agencies may be taken without the permission of the child's parent or guardian; provided, however, that any photograph taken pursuant to this Code section shall, if reasonably possible, be taken in a manner which shall not reveal the identity of the subject. Such photograph shall be made available as soon as possible to the chief welfare agency providing protective services and to the appropriate police authority. Montana Code Annotated (MCA) 2005 Table of Contents TITLE 52. FAMILY SERVICES CHAPTER 3. ADULT SERVICES Part 1. Problems of Aging Part 2.